Can Premier League leaders Leicester City hold their nerve? Tottenham's point at Liverpool would have been creditable in most circumstances - but the 1-1 draw at Anfield means Leicester City will open up a seven-point advantage with only six games left if they win at home to Southampton on Sunday. The Premier League season is now at the sharp end. Will there be any more twists before the champions-to-be edge over the finishing line? Is the title race wide open? The Foxes have a lead of some significance and Spurs manager Mauricio Pochettino admitted the result at Liverpool felt like two points lost rather than one gained. This is a reflection of the fine margins that will decide the destination of the title. It leaves Leicester with an opportunity to strike a heavy blow if they can beat Southampton (kick-off 13:30 BST). If Spurs win their remaining six games they will finish with 80 points. A Leicester win on Sunday will take their tally to 69 with six games left. It would give them a security blanket and put them in a position where they would feel they had thrown away the chance of a lifetime if they did not win the title. This is why Spurs, and indeed Arsenal as they lurk in the background, will hope Ronald Koeman's Southampton, harbouring hopes of European football themselves and knowing a win would leave them only a point behind West Ham United in fifth, can somehow stop Leicester's roll. If they can do that, Spurs will feel their hopes have been revived, leaving Pochettino and his players feeling much better about the point picked up via Harry Kane's superb goal at Liverpool. While Spurs may feel a tinge of disappointment at the Anfield result, they looked like a team holding their nerve and ready to continue the fight. They faced a grim scenario after Philippe Coutinho put Liverpool ahead, but they responded with resilience and a wonderful moment of quality from Kane. Could Claudio Ranieri win the title with Leicester on the last day of the season against Chelsea - the club who sacked him in 2004? Leicester have four matches at home and three away in their last seven but they close with visits to Manchester United and Chelsea and a home game against Everton sandwiched in between. As those three matches may well be testing, they will be looking at home games against West Ham United and Swansea City to push themselves nearer to the title. The idea of Claudio Ranieri returning to Stamford Bridge on the final day of the season as a Premier League champion will provide a delicious irony to this most unpredictable season. Spurs' last six games are split evenly home and away - and while they will feel confident in all, their final two away games will provide serious examinations at Chelsea and Newcastle United on the final day of the season. What stakes will the Magpies be playing for then? So while Leicester have that cushion of points, no-one will predict the title winners with serious confidence - but a win for Ranieri's men on Sunday may help them decide. There will be evidence to answer this question on Sunday - but it is hard to doubt Leicester on what we have seen this season. 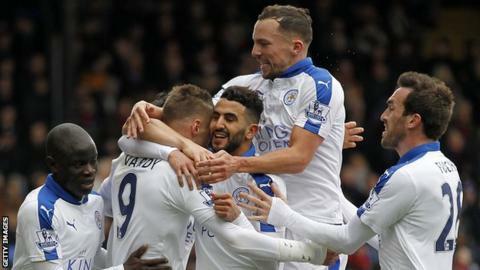 It was a year ago, on 4 April 2015, when the great recovery to survival started as bottom-of-the-table Leicester beat West Ham United 2-1. With the pressure to avoid relegation at its height, Leicester won seven of their last nine games to stay up. It not only started the rush of momentum that was uninterrupted by the sacking of manager Nigel Pearson and his replacement by Ranieri, it proved this group of players can cope with pressure. Pressure of a different kind yes, but still heavy pressure. And when the emphasis of Leicester's 2015-16 switched from scepticism to disbelief and on to expectation, they have been getting the sort of results that bear the hallmark of potential champions. Title winners are characterised as much by the results they grind out as well as the days when it all goes smoothly. Ranieri's side have won their past three games by a single goal, keeping clean sheets - and getting three points at potentially hazardous places such as Watford and Crystal Palace. The Italian has done superbly in deflecting pressure on to those who are, unlike Leicester, expected to be in the title shake-up. Will they continue to hold their nerve? They have so far and the doubters have been proved wrong on a weekly basis this season. Jamie Vardy: He will return to Leicester on a high after excelling for England, scoring a brilliant equaliser in the win in Germany and getting on target again as one of the few players to enhance their reputation in the loss to the Netherlands at Wembley. Riyad Mahrez: While Vardy's rush of goals has dried up in the league, in relative terms, Mahrez has stepped into the breach with the winners at Watford and Crystal Palace. He now has 16 goals and 11 assists - keep up that ratio and Leicester will be champions. N'Golo Kante: The bargain £6.5m summer buy from Caen has been one of the stars of the Premier League season and he is another whose spirits will be soaring after excelling on his France debut by scoring against Russia. He, along with Danny Drinkwater, is the glue in this Leicester side. Ranieri calls Vardy and Mahrez "The Pinnacle Of The Iceberg" - but he, along with everyone else, never underestimates Kante's contribution. Harry Kane: The man who makes the difference. Spurs were on the back foot at Anfield until Christian Eriksen chased a lost cause and gave the 22-year-old the chance to show his balance, poise, composure and finishing expertise to score on the turn. Kane is the Premier League's top scorer with 22 goals at a rate of one every 129 minutes. If he stays fit and keeps scoring, Spurs can still claim that first title in 55 years. Dele Alli: Quiet at Anfield but a prodigious, game-changing talent. Could be pivotal in the weeks ahead. Hugo Lloris: When Spurs were struggling to establish a foothold at Anfield, it was the France keeper who kept them right in contention with a crucial save from Daniel Sturridge, two fine stops from Adam Lallana and a performance of all-round assurance. Here we go again. Pressure off as expectations reduce and only the Premier League to fight for after exits from the FA Cup against Watford in the quarter-finals and a last-16 exit in the Champions League for the sixth successive season at the hands of Barcelona. So what comes next? A fine 2-0 win at Everton and then those FA Cup conquerors are swept aside 4-0 at Emirates Stadium. It means if Arsenal win their game in hand on Spurs they are only one point behind and in a position to put pressure on Leicester. Manager Arsene Wenger still believes they are in with a chance - which they certainly are - but just imagine if it was another case of too little too late again for the Gunners? Meanwhile, Leicester have an opportunity to put clear daylight between themselves and the Premier League's pursuing pack when they face Southampton at the King Power Stadium.